Child whose parents were slaughtered in Mumbai terror attack tells Indian PM he wants to return to India, be a rabbi there like his father. 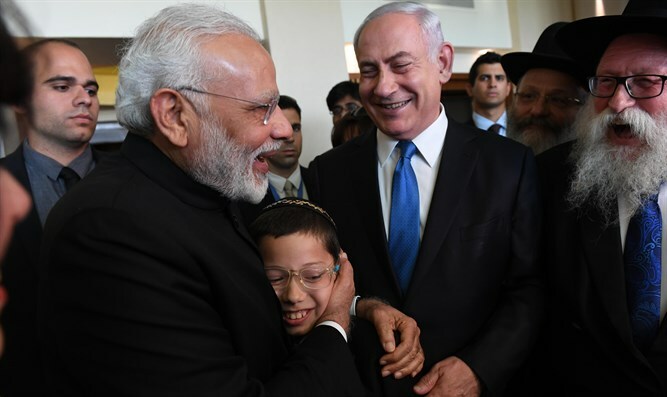 Israeli Prime Minister Binyamin Netanyahu and Indian Prime Minister Narendra Modi met yesterday with Moshe Holzberg, the young boy whose parents were murdered in a terrorist attack on the Mumbai Chabad center in 2008. Moshe, then two years old, was rescued by his nanny during the attack. Moshe met the prime ministers while accompanied by his grandparents on both his mother's side and his father's side. Rabbi Shimon Rosenberg, Moshe's maternal grandfather, who has raised Moshe together with his wife since the attack, told Arutz Sheva about the meeting with the two leaders. "India is a country of 1.5 billion people, and the Indian leader contacts us and asks for a meeting. The request came from them. They wanted to meet with the grandparents, and with Sanda the rescuer. The meeting was very moving, and the Indian prime minister asked Moishy what he wanted to say. Moshe said 'I love you' in English and gave him a hug, and that broke down all the barriers. He also told the prime minister of India that he lived with his grandparents in Afula, but his heart is in India." His grandfather said that Moshe wants to be a Chabad emissary in Mumbai like his father. "He was born there and as far as he is concerned, that is his home. He wants to have his Bar Mitzvah in two years, to visit India, and of course [to visit the grave of the Lubavitcher] Rebbe. He told the prime minister of India yesterday that when he turns 18 he wants to return to Mumbai and be the emissary and chief rabbi there." "Netanyahu raised his eyes, and it really moved everyone, and then Indian Prime Minister Modi told Moshe: 'You can come to India whenever you want and every time you come visit me."